Engaging and captivating the minds of your young learners are key to giving them the best possible early education. Equally important is ensuring their safety and security at all times. Panasonic’s primary education solutions help you deliver lessons that will not only spark their imaginations but also create the happy, inclusive environment in which young pupils can flourish. Engaging and captivating the minds of your young learners are key to giving them the best possible early education. Equally important is ensuring their safety and security at all times. Panasonic’s primary education solutions helps you deliver lessons that will not only spark their imaginations but also create the happy, inclusive environment in which young pupils can flourish. How do Panasonic solutions support primary education? Panasonic’s primary education solutions help you deliver lessons that will not only spark young pupils' imaginations but also create the happy, inclusive environment in which they can flourish. Students love to shoot, edit and produce their own videos. But researching, purchasing and setting up professional video equipment can be difficult and time-consuming. Our HDTV Producer solution is an affordable, all-inclusive HD production system with SD capabilities. From small classrooms and lecture halls, to auditoriums and theatres, Panasonic has a wide range of interactive projectors, Panaboards and displays that transform static presentations and lectures into multimedia, collaborative experiences that give students the keys to their own learning. Toughbook mobile computers and Toughpad tablets are the most durable and flexible in the industry. Built to withstand bangs, bumps and spillages, the Toughbook and Toughpad ranges are ideal for any classroom setting. The safety of students and staff is vital for every school. The distinctive quality and flexibility of our network cameras effectively reduce the threat of harassment and violence. 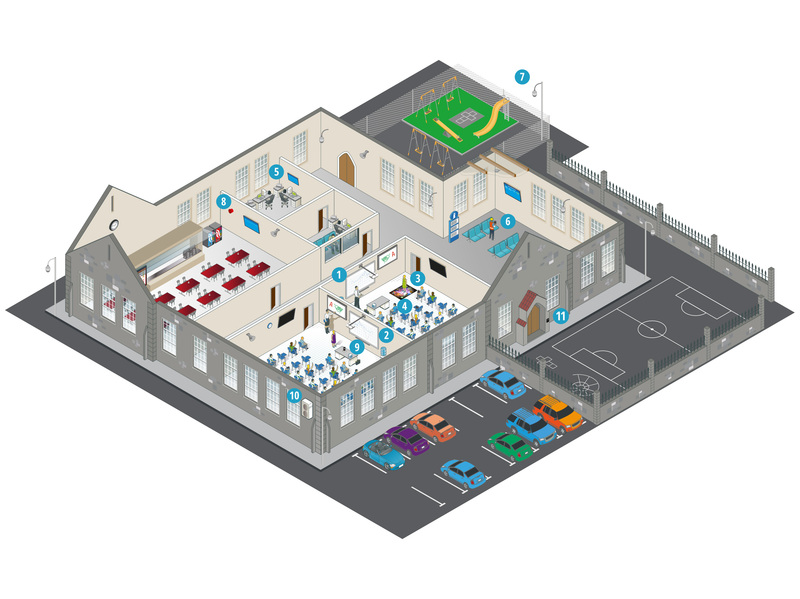 Suitable for monitoring school playgrounds, hallways, gyms, lunch areas and classrooms, they ensure the safety of students and staff, and prevent damage to school property.